Newly Constructed RMSA Building Vulnerable BY Abid PamporiDoda:; The condition of newly constructed building at Govt High School Bagla which has not even been inaugurated yet is in dangers due to the negligence of the R&B and education department. The protection wall on the back side of the said building was constructed recently but it has fallen and damaged a portion of the building. 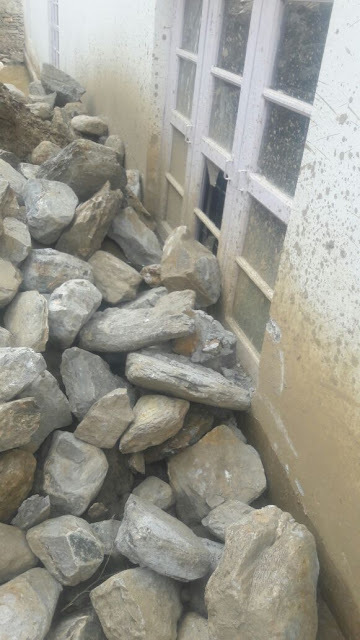 Due to the use of substandard material in the construction of breast wall it has collapsed twice and hit the wall of ground floor of the school causing damage to it. The graveyard situated behind the said school building has also been damaged . Besides the recently constructed septic tank of has also got damaged.Locals held the executing agencies and the education department responsible for the loss to the public property .They told the news agency that they have informed the concerned departments so many times by means of social media and technically but all in vain. 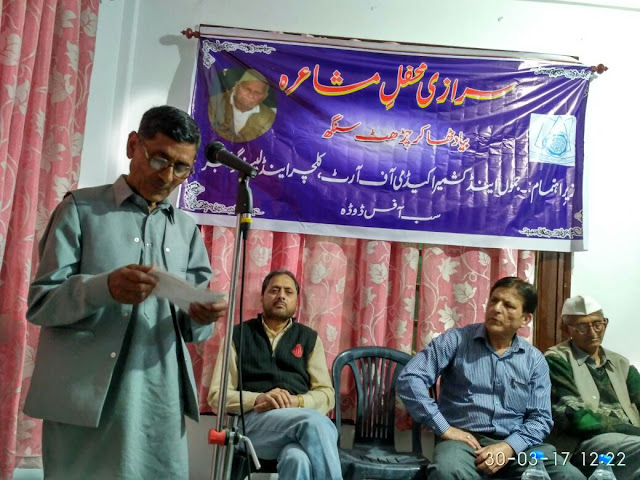 BY Abid Pampori Doda::A Sarazi Mushaira in the memory of Late Thaker Charat Singh was organised by J&K Academy of Art, Culture and Languages Sub Office Doda at Hotal Tak Residency Doda. In the Mushaira the poets from all over Saraz area of Doda participated and recite their poetry. A key note address was delivered by renowned columnist and Editor Highway Times Mr. Farid Ahmed Faridi. In his address he threw light on the poetic talent of Late Thaker Charat Singh. He urged the Sarazi poets to take forward the poetic legacy of Late poet. The Mushaira was presided over by Sh Jaimal Singh a renowned Sarazi poet and Dr R S Chib son of Late Thaker Charat Singh was the Chief Guest on this occasion. Sarazi poets who recited their poems in the Mushaira included Bhagat Singh Rana, Naib Chand, Bashir Sarazi, Jagdish Chander, Ali Muhammad , Jaimal Singh and others. Suspension of ZEO Assar, Distt. Doda. 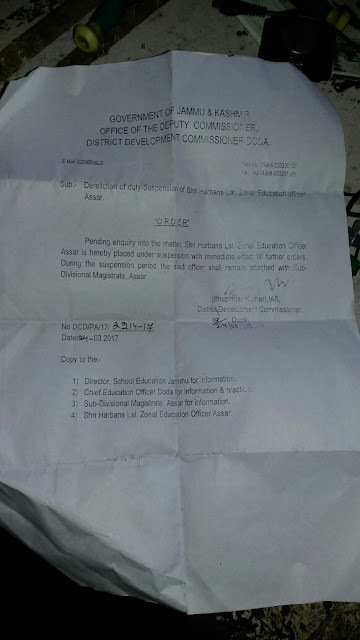 Suspension of ZEO Assar, Distt. Doda. 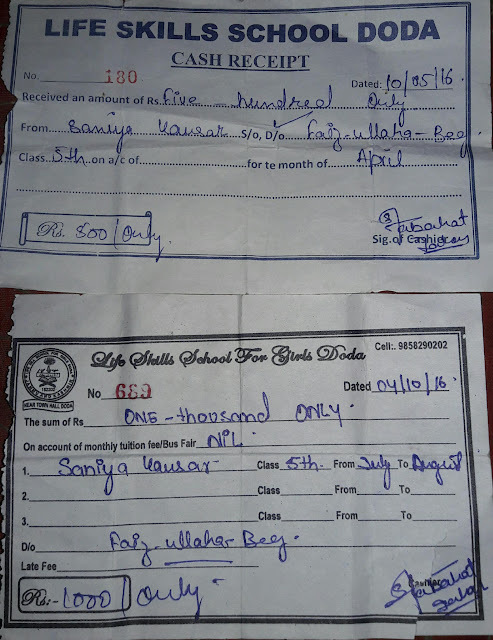 BY ABID PAMPORI Doda::Another praiseworthy feather to cap of Deputy Commissioner Doda Bhupinder Kumar is added in his major operation to suspend a defaulter ZEO of the district Mr. Harbans Lal ZEO Assar. ZEO Assar has always been a gravel in the porridge by his notorious character. Zone Assar during the period of the said ZEO had became a hub of corruption and malpractices. Many times it has been brought forth through the various means about the wailings of the masses and their exploitation by the official. The corruption charges, embezzlement of funds, treachery, tyranny topped in the zone. The news of the suspension is a major breather to the zone. The said ZEO has many charges standing against his name, thus on continuous cribbing and logical complaints by the residents of zone Assar DC flung into action and hence the guilty ZEO is placed under suspension and asked to report SDM Assar till further orders. 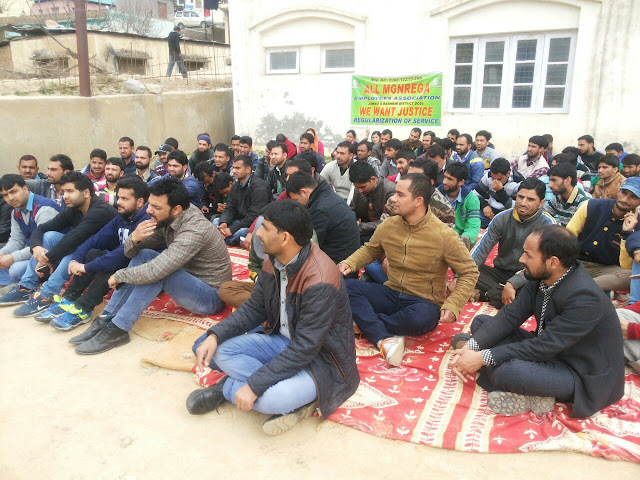 In the fouth consecutive day the MGNREGA employees doda remine peaceful in the premises of ACD office doda. 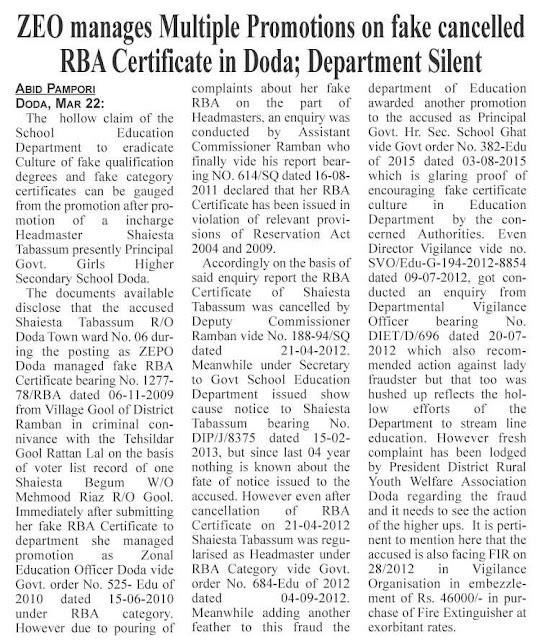 Number of un recognised schools functions in Doda due to negligence of department . Dr Jamsheed Ahmad presented a paper in Two Day National Conference at PG College Rajouri. 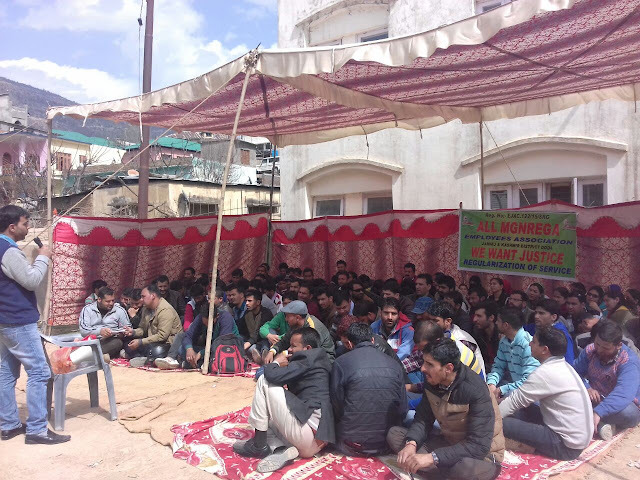 ACD Doda ensures enquiryBY ABID PAMPORI Doda, Mar 21: Public of Gai panchayat in Dessa area of Doda District demanded vigilance enquiry into works done under various Govt schemes like MGNREGA and SBM. 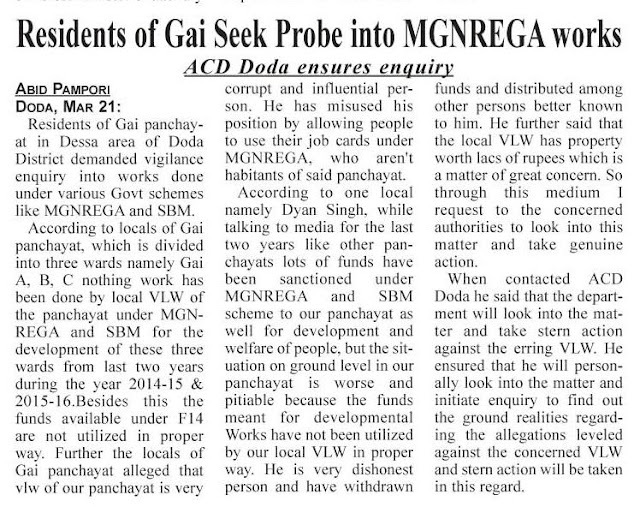 According to locals of Gai panchayat, which is divided into three wards namely Gai A, B, C no work has been done by local VLW of the panchayat under MGNREGA and SBM for the development of these three wards from last two years during the year 2014-15 & 2015-16.